The best way to avoid security breaches might be to pay for them. When a hacker broke into the network at George Mason University (VA) earlier this year, IT officials were absolutely powerless to stop him. Within minutes, the hacker compromised the school’s main Windows 2000 server and gained access to information that included names, Social Security numbers, university identification numbers, and even photographs of almost everyone on campus. Next, he poked around for a back door into other GMU servers that store information such as student grades, financial aid, and payroll. Finally, the hacker tried to crack passwords for other machines—machines in just about every department on campus. Curtis McNay, a system administrator who manages some of the university’s computing systems, saw the whole thing happen. After the break-in, McNay told the Washington Post that he knew from data streaming across his monitor that a break-in was going down. By the time the hack was halted, however, it was too late. Information surely had been copied; privacy most certainly had been breached. And after a week of investigating the scope and nature of the electronic break-in, university officials reluctantly sent an e-mail warning 32,000 students, faculty, and staff members that they were all vulnerable to identity theft or credit card fraud. Talk about nightmares. For an institution designated as a Center of Academic Excellence in Information Assurance Education by the National Security Agency, the hack attack was disastrous. But the debacle was only the latest in a string of hack attacks against higher education institutions. In the last two years, similar attacks have occurred at the University of Georgia, the University of Texas at Austin, the University of Missouri at Kansas City, the University of California-San Diego, and the University of California-Berkeley, to name a few. In all of these cases, the hackers exploited vulnerabilities in technology set up to foster collaboration and the free exchange of information. Across the board, the hackers scored sensitive information, putting users at risk. These cases may not represent the norm across North America, but increasingly, US schools are feeling the need to step up security measures to protect their users from invasions of this kind. Most schools take a traditional approach, purchasing the latest and greatest Intrusion Prevention System (IPS) technology from vendors that serve the corporate world (see box below). Of course, the safest way to secure a network is to do it the old fashioned way, with a smorgasbord of security products from a variety of leading vendors. Some of the hottest technologies on the market today are Intrusion Detection and Prevention (IDP) solutions that monitor "normal" network behavior at the network gateway and stop anything that they deem out of the ordinary. Also popular are Secure Socket Layer (SSL) virtual private networks (VPNs), which provide secure tunnels for remote connectivity, and deep-pocket inspection firewalls, which scan individual packets of information for viruses, worms, and other protential threats at the network edge. Undoubtedly, the best devices are those that combine all three of these technologies into one. This new category, dubbed Unified Threat Management (UTM) by Gartner analysts (www.gartner.com) in a December 2004 report, is comprised of jack-of-all-trades firewalls that incorporate SSL VPN and IDP technology into the appliance--products such as the FortiGate line from Fortinet (www.fortinet.com), and the REM Security management console from eEye Digital Security (www.eeye.com). Even vendors such as Symantec (www.symantec.com), Check Point Software Technologies (www.checkpoint.com), and Cisco Systems (www.cisco.com) have unveiled products along these lines, as well. Guess it's never too late to help customers harden their networks. Others prefer to handle security on their own, combining off-the-shelf tools with proprietary measures, to keep things safe. And some of these trailblazing schools champion a strategy that employs the services of “ethical hackers” to poke around a network to find vulnerabilities for system administrators to fix. While few schools actually admit to employing these good-willed hackers, many experts say the method is a reliable way to stay one step ahead of the bad guys, and two steps ahead in the security game. For roughly $2,000 per month, 'ethical hacker' Paul Tatarsky has virtually eliminated hack attacks from the UC-Santa Cruz School of Engineering network. If anybody understands Sookying’s comments, it’s Paul Tatarsky. Tatarsky has been an ethical hacker for the better part of 12 years, mostly breaking into the School of Engineering network at the University of California-Santa Cruz . Tatarsky started his career as an ethical hacker on staff as a network administrator for the department; then moved into an outsourcing role as a technician for CounterSign Software (www.countersign.com). 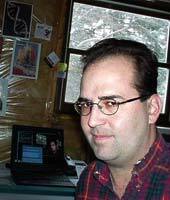 Today, he works for the school again, conducting contract ethical hacks remotely, from his home in Madison, Wisconsin. (Because the term “hacking” has such a negative connotation, however, Tatarsky prefers to call his line of work “auditing.”) When it’s time to test the security of the UCSC network, Tatarsky simply heads to his home office in the basement, sits down at his personal computer, and hacks away. After spending so much time “auditing” the network at UCSC’s School of Engineering, Tatarsky’s approach is, at this point, formulaic. With a set of scanning tools such as Nmap (available from the site www.insecure.org), he enumerates—that is, physically counts—all network systems and services running on the network. Next, he performs a Nessus vulnerability scan (download from www.nessus.org) against the systems found to be running “targets,” such as Web servers, database servers, or in particular, Microsoft networking products. He compares the output of the Nessus findings with a collection of constantly changing security flaws (listings of flaws that have recently been exposed elsewhere) and proof-of-concept exploits (actual hacks that have occurred elsewhere)—a collection that he keeps by staying current on mailing lists, and by watching for “insider” advisories. Finally, in a controlled environment, Tatarsky uses a tool called VMware (www.vmware.com) to conduct further “tests” of the exposed services, with the exploits. This tool mirrors applications on certain hosts to enable him to attack a virtual machine, instead of the real thing. If the exploit is a threat, he’ll take preventative measures such as adding a firewall, applying patches, or adding a firewall rule. When he tests published exploits, he looks to see if an exploit is actually a Trojan (which looks innocuous when it comes over network transom), how it works, and whether it creates any further vulnerabilities that he can use in his audit programs. Tatarsky also checks to see how easily the exploit can be converted into “worm mode,” which enables a quick set of commands to follow the attack and download or install backdoor software (also known as “bots”) to allow remote control of the target unit (Web server, desktop, etc.). When he tests unpublished exploits (exploits that occurred elsewhere, on similar systems, and which frequently become known because the hackers themselves brag about the hacks in postings), Tatarsky performs a fair level of network analysis. He looks for what he calls “new things,” with Intrusion Detection System (IDS) technology such as that from Snort (www.snort.org). With this tool, Tatarsky watches for unusual packets and patterns of use that might lead him to the new viruses and threats. While he d'esn’t claim to inspect every packet, he notes that certain activities draw his attention to a possible “prove” or “test” of an emerging security flaw. For example, Tatarsky says he’s noted several “public exploits” being tested against his systems before they showed up in various forums (again, hacker bragging). In one such instance, he documented and recorded a successful compromise of several of his own institution’s Sun UNIX machines, and managed to disable the service in the School of Engineering before any havoc was wreaked. Elsewhere on campus, other departments weren’t as lucky. Generally, in fact, this is the case. During the last round of hack attacks at UCSC, the School of Engineering experienced zero infected systems, while the rest of the campus had more than 150. In the Sasser worm outbreak of 2004, the School of Engineering lost 15 machines to the attack; elsewhere on campus, other departments lost more than 200, all-told. Finally, during the sizable Linux attack reported at the University of California-Berkeley and Stanford University (CA) in the second half of 2004, literally hundreds of machines on these campuses were crippled by the hack, but at UCSC’s School of Engineering, nobody has found a compromised machine yet. For roughly $2,000 per month, Tatarsky has virtually eliminated hack attacks from the School of Engineering’s network. Still, not every school supports ethical hacking. At Carnegie Mellon University (PA), for instance, technologists openly campaign against it, maintaining that hiring someone to help lock down a network directly contradicts the school’s commitment to an open computing environment. Pradeep Khosla, dean of the School of Engineering, admits that some CMU technologists engage in “redteaming,” or penetration testing, when they are building software programs, but insists that the school has never hired people specifically to redteam its network as a whole. Khosla says that most of the vulnerabilities hackers exploit are in commercial software programs that no amount of ethical hacking can fix. With this in mind, CMU set out in 2003 to develop a state-of-the-art network that can teach itself how to survive an attack. The project is the mission of CyLab, CMU’s public/private partnership to develop new technologies for measurable, available, secure, trustworthy, and sustainable computing systems. Working closely with the CERT Coordination Center (a CMU-based and internationally recognized center of Internet 4 security expertise) as well as the US Department of Homeland Security National Cyber Security Division, CyLab boasts as its mission the goal of “protecting all computer users from interference by cyber terrorists and hackers.” As Khosla explains, to proactively improve security, the endeavor is designed to focus on the successes instead of the failures—much of what the immediately reactive strategy of ethical hacking fails to address. IT leaders at Purdue University (IN) hold similar opinions about ethical hacking. There, at the school’s Center for Education and Research in Information Assurance and Security (CERIAS), Director Gene Spafford encourages students and administrators to expand security efforts to include issues of policy, architecture, and number of servers. When asked about ethical hacking, Spafford says that instead of identifying “18 different” weaknesses in a particular protocol, he supports a network that denies the protocol access in the first place. He adds that while ethical hacking might address vulnerabilities of the moment, the strategy fails to proactively address weaknesses down the road. Instructors race through topics like symmetric versus asymmetric encryption, and hacker attack behaviors. If the students pass the test, they get the ultimate seal of approval: Certified Ethical Hacker. His suggestions? First, Spafford urges administrators to separate (that is, not integrate) systems with different policy and security needs, and to isolate those important systems that don’t need to be hooked into the network. Next, he suggests that administrators use switched hubs (which ensure that data gets from one point to another), virtual private networks (VPNs), and redundant network channels, instead of running connections over one-way ports and unencrypted lines. He advocates the use of off-the-shelf consumer products such as firewalls and IPS tools, but notes that the key to success with these is staying on top of patches, and incorporating them with proprietary security measures. Last, Spafford calls for depth in a network, noting that the more systems a hacker has to hack to get to the heart of a network, the more secure that network really is. Trends, however, may be proving Spafford wrong. A number of schools are beginning to offer classes in ethical hacking to get their system administrators up to speed in frontline network defense. A new class at Mt. Sierra College (CA), for instance, is designed to teach students how people will try to break into network systems—and how they will succeed. For $4,000, the course prepares corporate-level students for an exam offered by the International Council of E-Commerce Consultants, or EC-Council. Instructors race through topics like symmetric versus asymmetric encryption, hacker attack behaviors, and well-known network weak points. If the students pass the test, they get the ultimate seal of approval: Certified Ethical Hacker. Another class, this one at Marshall University (WV), teaches undergraduate and graduate students about security by familiarizing them with common tools and strategies that hackers use. And while the class curriculum d'esn’t specifically help students learn how to go about hacking a network, Brian Morgan, assistant professor of Integrated Science and Technology, admits that intelligent students can certainly “put two and two together” from what they learn, and do just about anything they’d like. Morgan says he put the class together after he had taken an ethical hacking course sponsored by New Horizons Computer Learning Centers (www.newhorizons.com), a company that sponsors a variety of distance education opportunities. Down the road, he says, he hopes to develop a new course specifically geared toward teaching students how to engage in ethical hacking of their own.